Luck and luxury are on your side with this beautiful “Cleopatra Style Necklace And Cobra Crown 2-Pcs Set”. The set is in good vintage condition. 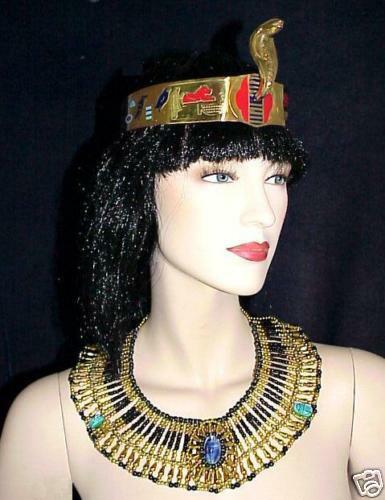 If you collect "Egyptian" costume jewelry, you must add this set to your collection! 100% hand-made in Egypt by professional jewelry artists. This set Includes: One (1) Beaded Necklace: The necklace has the elegant look of ancient Egyptian style, and modernized in a cool oval brooch centerpiece for bold presence. The oval brooch in the center has large blue-color scarab displays the Egyptian Character For Good Luck, framed with gold and black round and teardrop beads. The necklace has 18 hand-strung rows of black and gold small and large round beads; golden mummy beads (teardrop beads). Around the necklace there are 2 hand-carved turquoise colored scarabs. It measures 25 inches circumference, 16 inches around the neck, and 3 inches wide. One (1) Cobra Crown: You may wear the crown as an Egyptian costume in any occasion, or you can wear it for protection! The crown made of Best Quality brass with hand carved and hand colored Hieroglyphic letters. It has a flexible wide elastic band for easy fitting. Measures 21 inches circumference and 1 1/2 inches wide. Cobra measures 4 inches height. Rearing cobra is an ancient symbol of sovereignty, fertility and protection from danger. Ancient Egyptian kings were often shown wearing crowns...described as the "war crown", adorned with golden discs with the cobra goddess "WADJET" on their forehead rising up in anger, supposedly to spit flames in defense of the monarch! Each item I sell is a unique design features exquisite details as seen in the pictures, and no two items are exactly alike. My policy is offering the highest level of quality and cost and when the product reach the customer, your satisfaction is guaranteed. Payment and shipping: I accept any major credit card through Paypal. Shipping is free only for the USA buyers. The shipping cost includes delivery confirmation. I ship world wide. International buyers please ask for shipping quote before you bid on this item. I ship within 24 hours after receiving payment. All my items are BRAND NEW and professionally packed, and shipped to you. Please visit my current sales at Bonanza and save on S H with multiple orders. " Thanks for considering this item " Pay me securely with any major credit card through PayPal!